"I have been making this dip for over 25 years and it is always the first to be eaten at parties. Delicious! Serve in a dipping bowl and eat with crisps of French bread." In a medium bowl, mix together cream cheese, crushed pineapple, onion powder and garlic. Mix in reserved juice from pineapple as desired. Chill in the refrigerator until serving. 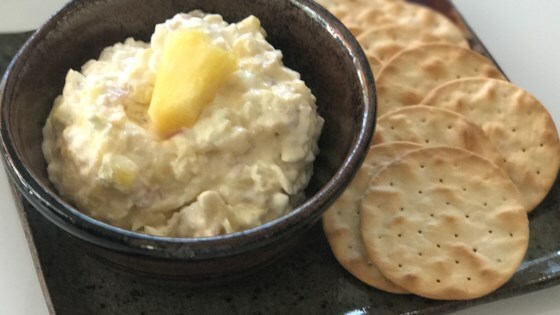 Even without the onion and garlic, which my husband can't eat, this is a great dip for not only chips and pretzels, but for fruit as well. It does NOT stick around long either. I have been making this for some time, but using only cream cheese and pineapple. It is creamy and refreshing and I think it is best served with pretzels.